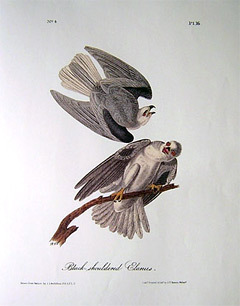 Pictured (right) is John J Audubon’s illustration of the Black Shouldered Elanus, today commonly referred to as the Black Shouldered Kite. Mr. H. WARD, who accompanied me on my expedition to the Floridas, found this species breeding on the plantation of ALEXANDER MAYZCK, Esq., on the Santee River, early in the month of March, and shot three, two of which, a male and a female, are now in my possession. Their nests were placed on low trees near the margins of the river, and resembled those of the American Crow, but had none of the substantial lining of that bird’s nest. Mr. WARD states, that at this time they were seen flying over the cane brakes in pursuit of large insects, somewhat in the manner of the Mississippi Kite, and that they were very shy. BLACK-WINGED HAWK, Falco melanopterus, Bonap. Amer. Orn., vol. ii. FALCO MELANOPTERUS, Bonap. Syn., p. 31. Falco dispar, App. p. 435. BLACK-SHOULDERED HAWK, Falco dispar, Aud. Amer. Orn., vol. iv. p. 397.